The Ginger Wolverine is man enough to ride a tiny pink bike. Let's be real: even though they're important, you can't take these guys too seriously. I mean, they're on the field for like eight plays a game. Nevertheless, they are on the roster and they do actually play football, so the kicking game specialists get their own preview. Barring injury, these are going to be the guys the Packers stick with this year, given that there's nobody else on the roster at each of their positions. Mason Crosby - Crosby posted career highs in just about every possible kicking category last year, which is nice, but comes with a pretty significant caveat: it's almost impossible to evaluate a kicker based on a single season performance. They perform their duties so rarely that to weigh any one season more than another is to rely on a ridiculously small sample size. So to that end, I don't put a lot of stock into Crosby's career year last year. That said, he's been steadily improving since he came into the league, and I don't know if there's any reason to expect anything but another solid year from the former Colorado Buffalo. Tim Masthay - Hey, did you know that the Packers have a punter? You might be forgiven for forgetting Tim Masthay exists, since there were 27 players in the league who punted more often than he did last year. In his brief cameos on the field, though, Masthay was solid. Do you remember his solid performances at home against Chicago and on the road against New York last year? No, probably not, because you don't pay attention to things like that. But they still happened and Masthay's punts were important parts of those games. Hopefully he punts even less this year, but puts up equally good numbers. Brett Goode - I learned something today. Brett Goode's last name isn't pronounced like the normal word "good." 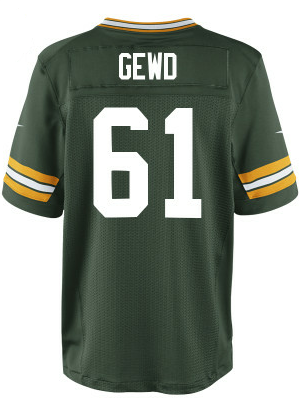 According to his team bio, it's pronounced (emphatically) as GEWD. I wish he had that on the back of his uniform. I think that would look nice. Anyhow, other than snapping the ball for field goals and punts, Goode is about as anonymous as a football player can be. He's only recorded 10 tackles in four years with the team, but I guess that's okay for a guy who doesn't play a ton. On a random side note, I wonder if Goode every tries to convince the coaches to let him do other things, like play tight end or linebacker or something. I suppose that depends on how much he's getting paid to do literally one thing. I guess my point for this whole paragraph is there's not a lot to say about long snappers.